The church choir rehearses weekly to lead the congregation in the singing of hymns both old and new, as well as sometimes singing anthems or songs during the service and Holy Communion. The choir also plans and leads occasional services at Christmas and in Holy Week, where a café style worship is popular. Our morning services are accompanied on the organ and piano by our two keyboard players. 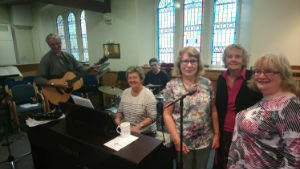 A small music group, comprising guitar, accordion, drums and keyboard, leads the singing at the 4.30pm monthly Praise Party services; anyone who can play an instrument is welcome to join our merry band! The church also has a handbell choir, which at present isn't active, but hopefully will restart soon. We would welcome new members in any of the above groups; contact Linda through the Church Office or the Administrator's contact page, for more details and information.